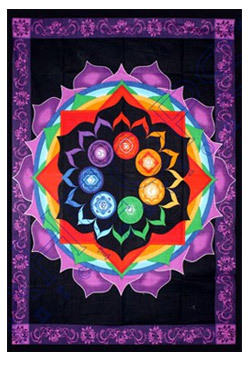 Rainbow Chakra Tapestry - 52" x 76"
There are seven chakras, each possessing a unique color and energy vortex which governs a specific zone within our bodies. Each spinning wheel transmits powerful life force energy to the body. It is said, that all color comes from the seven rays which emanated from the great white light at the center of the universe. Let the colors of the rainbow chakra, with their vibrating energies heal and guide you. This handmade, 100% cotton tapestry can be used as a wall hanging, room divider, bed sheet, beach blanket, or window curtain.